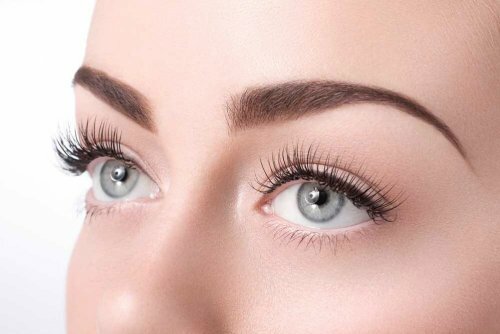 How to keep eyelashes healthy and beautiful? Thick and long eyelashes give expression of female eyes, but only a few have this luxury. However, in the present time, there are methods that will make your eyelashes thick, long and at the same time natural. The most convenient and efficient way — increase. Eyelash extensions have become an essential procedure of many beauties. But that's not just eyelash extensions, they need good care. Do not forget that this artificial eyelashes and they are very easy to spoil. 1. Absolutely not scratching and rubbing the eye. Such actions will result in the loss of artificial and even their eyelashes. Moreover, the accreted material can be reversed. 2. Bathing under a shower or in water bodies is acceptable. But not to wipe with a towel and gently blot. It is better to give the cilia dry naturally. Trips to the bath is not recommended, a pair of hot melt glue, which stick artificial eyelashes. 3. Absolutely contraindicated to use decorative cosmetics, its composition contains fat. Mascara also should not be used, in principle, they do not need. But if I was so eager, there is a special mascara for eyelash extensions. 4. Wearing lashes for a few months is unacceptable, will not look aesthetically pleasing. They require timely correction, which is quite simple and fast, the sight again becomes as tempting. 5. Continuously wear extended eyelashes harmful. We need to rest her eyelashes and eyes, avoid severe stress. Therefore, you should take a break for 30 days every 4 months. 6. Deciding to remove the lashes, you don't need to do yourself, and to see a specialist. Doing it yourself, it is easy to compromise the integrity of your lashes, and even worse, the further growth. If there is no other way, and you have to remove most, then softening the glue is very fat cream or oil. Then carefully remove them with your fingers. 7. Before the next building you will first need to strengthen these eyelashes using various oils. Now cute women familiar with the rules of caring for extended eyelashes. Grow, care for and be beautiful.